Soil pH measures the acidity or alkalinity of a soil. The pH (potential Hydrogen ions) scale puts 7.0 at neutral. That means the soil is neither acidic nor alkaline. It’s balanced. A soil pH range of 6.8 to 7.2 is near neutral. Places with limited rain fall generally have alkaline soil and areas with higher rainfall usually have acidic soil. Texas soil, therefore, with its high clay content and low rainfall, would be on the alkaline side. To get your soil tested for its pH level, you can get a kit at a gardening store or, if you live in Austin, you can ask the Travis County Extension Office for a free kit. They can be reached at 512-854-9600. A test will tell you where your soil pH falls. This will help you decide what nutrients you are missing in your soil and what you can do to bring your soil pH back to neutral if you so choose. Although it may be easier to make a soil pH more alkaline, it isn’t a lost cause to get it to be more acidic. You can use sulfur to make the soil more acidic or rotted compost and shredded leaves if you’d prefer to stay on the organic side. It’s best to adjust the soil pH over several seasons. This is not something you want to rush. If you opt to work with your natural alkalinity, you can plant herbs and plants such as clematis, oleander, geraniums, periwinkles and Texas mountain laurels. These all work well in an alkaline soil. Another thing to help alkaline soils is to make them deeper. This will support a stronger and more resilient root system. 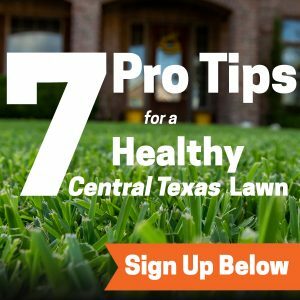 Lawn grasses require at least six inches of soil. Flowers and vegetables require between 6 and 12 inches. Some folks recommend that you add soil to and build raised planting beds to create garden spots on shallow, rocky soil. Why? Texas soil has a high level of potassium and phosphorous but it lacks some other nutrients to support optimal plant growth. These raised planting beds can be turned into beautiful little places to grow plants. Before taking another step with fertilizing your garden or planting, you should test your soil and get a professional’s advice on what steps to take next. If you’d prefer, we at Emerald Lawns could help with that. We’ve been making grass green in Central Texas since 2006. Get a free, no-obligation evaluation. Just call us at 512-990-2199 for more information. What are the components of healthy soil?